We can say that this UB team is different from other UB teams from the past, but at some point you need proof that this is the case. This game was proof that this team is different. UB was playing a good team on the road. UB gave up a Hail Mary TD pass before halftime and a blocked punt for a touchdown. I can tell you with 100 percent certainty that no other UB team in our lifetime would have beaten a good team on the road having given up those two things. The Bulls dominated the first half but were only up 12-7 at halftime because of the Hail Mary. UB took control in the third quarter after Cam Lewis intercepted his second pass of the day. The Bulls were up 22-14 when the blocked punt tied the score at 22. UB then took the lead 29-22 with a drive led by RB Kevin Marks. This was Marks coming-out party; he had 138 yards on the day and two touchdowns. Temple tied it again at 29 with 4:58 to play. Big time players make big time plays when you need it most. Tyree Jackson hit Anthony Johnson from 29 yards out with under a minute to play to give the Bulls the seven point win. Johnson had a remarkable game considering he was throwing up on the sideline and his best friend had died the night before. 10 NFL scouts on hand had to be impressed with both Jackson and Johnson. Jackson finished the day with 275 yards passing and three touchdowns. UB is home next week at 6pm to face Eastern Michigan. Both MAC teams come into the contest 2-0. The Eagles upset Purdue in Ross Ade 20-19. The Bulldogs started out hot with an interception return for a TD in the opening minutes of the game. Jake Fromm was very efficient going 15 of 18 for 194 yards and a touchdown. Georgia defense was awesome. The Bulldogs outgained South Carolina on the ground 271-54. 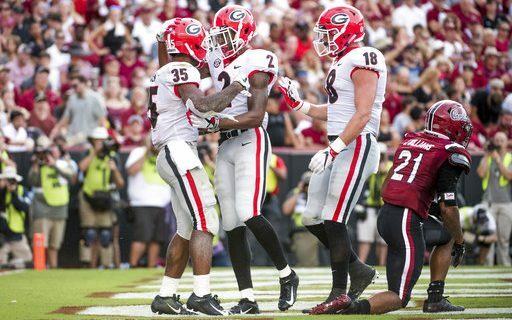 Georgia has replaced Nick Chubb and Sony Michel with a trio of backs that all looked good. The Aggies should have pulled the upset but missed too many opportunities. A couple of missed field goals and a fumble out of the endzone cost A&M the victory. Clemson’s defensive line was dominating vs the run. Aggies QB Kellen Mond was elusive and threw for 430 yards in defeat. The Aggies missed a two-point conversion with under a minute to play that would have tied it. Clemson should go with Kelly Bryant as QB. He was much more effective in my eyes than Trevor Lawrence. Bryce Love was held to only 29 yards in Week 1 against San Diego State. This week he had 136 yards and a touchdown in leading the Cardinal offense. The Stanford defense did the rest. USC scored their least points in a game since being shutout in Washington in 1997. Freshman QB JT Daniels was pressured all day. He was sacked four times and threw for only 215 yards. Welcome to the Herm Edwards era in Tempe. The Sun Devils get their first big win with Edwards as coach upsetting the Spartans. ASU rallied from a 10-point deficit in the fourth quarter to get the victory. Brandon Ruiz kicked a 28 yards field goal as time expired to give the Sun Devils the win. Michigan State struggles when traveling west in the regular season. The loss means Sparty is 1-13 in games out west during the regular season. Redzone problems cost MSU. Three times Michigan State drove the ball inside the ASU 10-yard-line. They could only muster 3 points. *Georgia Tech gives up two kick-off returns for touchdowns in a 49-38 loss to a good South Florida team. *Mississippi State was dominant on the road in Kansas State. The Bulldogs blowout the Wildcats 31-10. *Kansas snaps a 46 game road losing streak by winning in Central Michigan 31-7. *Call it a Michigan hangover if you want but Notre Dame didn’t look good by beating Ball State 24-16 at home. Irish QB Brandon Wimbush was picked off three times. *Florida State trailed most of the game but survived Samford 36-26. Could Willie Taggert be in trouble after only two games? *Kentucky snapped a 31 game losing streak to Florida beating the Gators in Gainesville 27-16. It was their first victory over the Gators since 1986; they hadn’t beaten the Gators in Gainesville since 1979.